DALLAS, Sep 22, 2011/ — Debuting at International Vision Expo West, Zeal Optics of Boulder, CO, known for launching the world’s first snow goggles with GPS technology, will debut a new line of sunglasses, incorporating proprietary technology that enhances vision for people who Move at the Speed of Life™. Zeal will be the first optical company to use a manufacturing process that is more environmentally friendly for production of its entire optical portfolio. 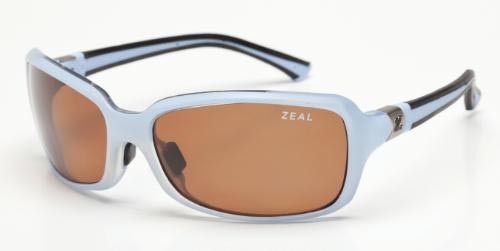 The new line of 18 colorful styles features the optical market’s newest lens technology that is exclusive to Zeal. Hyperion™ Lens Technology produces hybrid, injection-molded de-centered lenses. They have the lightness of polycarbonate materials combined with the optical clarity of glass, resulting in wide, crystal clear views with an abbe value of 38. They meet all ANSI, EU, and AU impact-resistance standards. Most styles in the line are available with prescription lenses. Unlike other manufacturers who apply film or coatings to sunglass lenses to improve eye protection, Hyperion Lenses embed new highly specialized SPF film and formulated resins to significantly reduce the sun’s glare by 99 percent, cut 100 percent of UVA, UVB and UVC rays and eliminate 95 percent of High Energy Visible wavelengths that can lead to serious eye diseases. The company will offer polarized and non-polarized styles in the line. “Some people prefer a non-polarized view of the world,” said John Sanchez, vice president of Product Development at Zeal, “but most companies achieve this by merely tinting their lenses. Instead, we literally fuse compounds into the lens material to protect your eyes from sun damage.” For polarized models, superior polarization technology is built into each Hyperion Lens to block undesirable light waves and significantly enhance color so that you can live your life in high definition.